On December 6th, 2018, at around 12:30 p.m., a group of workers were pruning a vineyard off a dirt road north of Floral Avenue, west of South. Jameson Avenue. Three men in a black Dodge Durango drove up, got out and demanded the workers to hand over their money. The suspects, two Hispanic and one African-American, wore hooded sweatshirts and masks. Two of them were armed with handguns. A contractor, who was paying the employees at the time, had a large amount of cash taken from them. Two of the field workers also handed over their money. 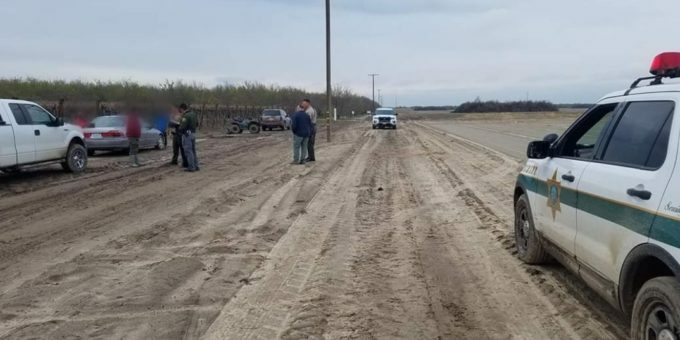 The two Hispanic suspects got into their SUV, however, 22-year-old Dion Loftis of Hanford did not make it back to the vehicle. Loftis stumbled and fell, dropping his gun. One of the victims picked up the gun and began firing shots at Loftis. He was struck three times; twice in the buttocks and once in the calf. The victim continued shooting at the back of the SUV as it drove away. The other workers quickly ran over and held Loftis down as they waited for deputies to respond to a 911 call that was made. Deputies arrived and gave Loftis medical treatment. An ambulance responded and took Loftis to a hospital to undergo surgery. Detectives are asking the public to be on the lookout for the suspects’ black Dodge Durango that may have bullet holes in it. There is a strong possibility it is in the Hanford area. Anyone with information about this case is asked to contact the Sheriff’s Office at (559) 600-3111, Detective Lindsay Milchovich at (559) 600-8174 or Lindsay.Milchovich2@fresnosheriff.org You may also contact Crime Stoppers at (559) 498-7867 or www.valleycrimestoppers.org You will remain anonymous and may be eligible for a cash reward. Information/photo Fresno sheriffs department.